New book, 64 pages, FOR015. 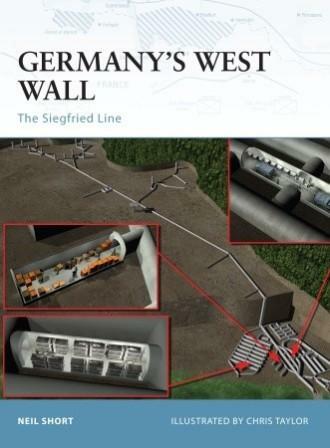 The West Wall (or the Siegfried Line as the Allies called it) played a crucial role in the bitter fighting of 1944 and 1945 in North-West Europe. Constructed in the period immediately after the remilitarisation of the Rhineland in 1936, the Wall stretched for 300 miles from Cleve in the north to the Swiss Border and consisted of some 14,000 pillboxes. The Wall initially blunted the US attack, and Hitler used it as a foundation from which to launch the Ardennes Offensive. This title takes a detailed look at the development and form of this key fortification, examining the principles of its defence in visual depth, and discussing its fate in the wake of the Allied onslaught. This item was added to our catalog on Tuesday 14 February, 2012.